Judge – Mr Willie McCornick, Barquhill, Newton Stewart. With the uncertainly of receipt of the Single Farm Payment, purchasers at all the spring sales have been cautious and at the Galloway Cattle Society sale held in Wallets Marts, Castle Douglas it was very evident that purchasers had a tight budget and as a result averages were down on the year with only 50% of the bulls sold. Now a one day show and sale, the male champion from the morning show received the top price of the day, Troloss Juggernaut from Troloss Farms, Elvanfoot, Biggar, Lanarkshire, this January 2014 born, son of Blackcraig Rasputin sold for 5000gns to Steve Langdon for his 100 head herd based at Luckworthy, Mollan, South Molton. Mr Langdon also purchased another Troloss entry, Troloss Jester, again a Rasputin son, he is a month younger than the champion, he sold for 2000gns. Both of these bulls’ dams go back to Kirkstead Lieutenant which was purchased for 6000gns when the Troloss herd was established in 2005. 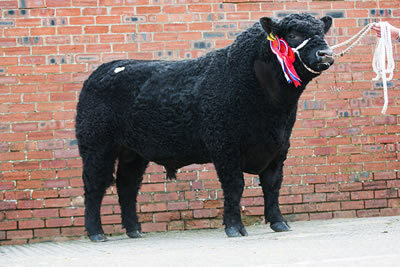 The reserve male champion Jock of Balgray from husband and wife team, David and Rosemarie Cornthwaite, Balgray, Lockerbie, Dumfries and Galloway, is a May 2014 born bull and is sired by Blackcraig Sid, he stood second to the champion and sold for 2000gns to local breeder Mr George Gourlay, Craigmuie, Moniaive, Thornhill, Dumfries. The Finlay Family, John, Ann and Iain received the female champion and topped the female trade for Blackcraig Dusty V514, another Blackcraig Sid progeny, this 27 month old sold for 4000gns to new breeders John and Harry Donughy of Claudy, County Londonderry, Northern Ireland. The Donughys also purchased the next top price heifer, Blackcraig Dusty V498 another Sid daughter for 3000gns, both heifers sold AI’d to Diamond B Universe. The next best price for the Finlay family was 2000gns for Blackcraig Noreen V494 again by Blackcraig Rasputin, she is out of a Blackcraig Nimrod daughter, this September 2013 born heifer, which is AI’d to Diamond B Universe is off home with Brendan O’Maly, Bothesial, Recess, Co Galway. The reserve champion heifer Nerys Vienna of Nether Cleugh from Peter Hunter Blair and Sons Duncan and Andrew of Nether Cleugh, Dalry sold for 1900gns, this March 2013 born heifer was purchased by John Welsh, Nether Craigenputtock, Dunscore, she is a Blackcraig Tom Tom daughter and out of Nerys Quintanna of Nether Cleugh. The bulling heifers peaked at 2000gns for Twinkle Xana of Over Barskeoch, this March 2014 born heifer from Gib, Mary and Allan McMillan, Over Barskeoch, Dalry who exhibit under the Wallace Family name of Hannaston, Dalry is off home with Rena Paterson, Low Threemark, Stoneykirk. This Viper of Over Barskeoch daughter will be shown this year. Troloss also received the next best bull price of 3800gns for Troloss Jaguar, this March 2014 born bull is also a son of Rasputin but this time his dam Rose 20th of Auchenhay is a daughter of Blackcraig Jury. 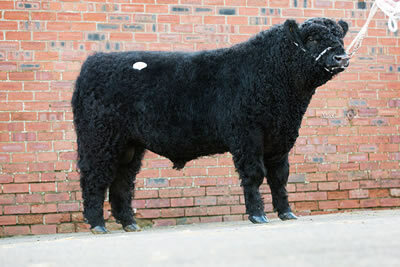 He sold to Jimmy Ions, Thornyburn, Falstone, Hexham for his 130 head Thornyburn herd. 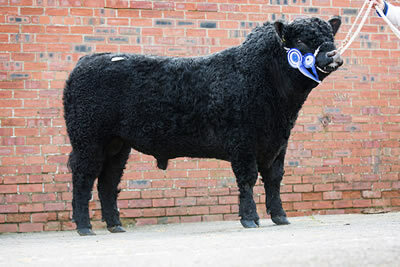 There were two bulls at 3000gns, Huntly Aviator from R & M McIntosh, Outer Huntly, Ashkirk, Selkirk, is a son of Blackcraig Kodiac who was interbreed at both the Royal Highland and Great Yorkshire shows in 2009 is off home with Percy Farms, Emblehope, Tarset, Hexham. The other one at that money was Spectre of Fingland from Jimmy Wallace of Fingland, Dalry, Castle Douglas he sold to Miles Partridge, Townswood Farm, Poundsgate, Devon, Spectre is by X Factor of Fingland, a bull which is out of Lady Polka 1st of Fingland, a cow that has bred sons to 10,000gns and 11,000gns. The Wallace’s also sold Skyfall of Fingland for 2800gns, this Penninghame Trooper son sold to Alastair Murray, Sewingshields, Haydon Bridge, Hexham. 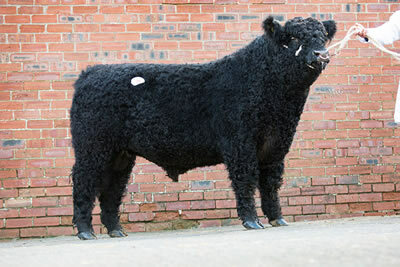 Robert McTurk Barlaes, Dalry also sold Barlaes Nero for 2800gns, this December 2013 born bull is by home bred bull Barlaes Colossus and out of Barlaes Robina 27th, he sold to Alistair Busby, Unthank, Ewes, Langholm. Kilnstown Farms Ltd, Bewcastle, Carlisle sold Wizard of Kilnstown, this September 2014 born Buccleuch Adonis son was reserve senior champion and is out of Doreen 31st of Kilnstown who was dam of Super Mario, who won various winter show championships. 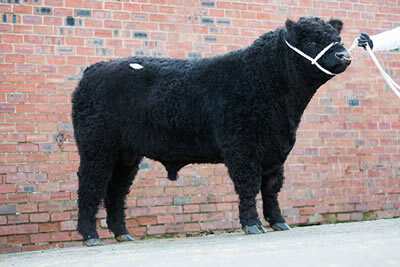 Wizard is off home with Philip Robson of Middle Horselyhope Farm, Consett for 2500gns. In the unled section, the single champion Kirkstead Amber X27 from RA McClymont & Son, Kirkstead, Yarrow sold for 1300gns, this Ringleader of Nether Cleugh daughter sold to new breeder AP Carlin, 14 Main Street, Mountfield, Omagh, Co Tyrone. 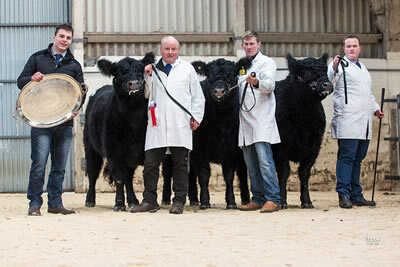 The McClymont’s also received the pair championship for Kirkstead Nancy X8 and Kirkstead Amber X20, Nancy an Ronaldo of Fingland daughter made 1800gns and sold to Judith Brearley, Highcliffe Farm, Guisborough, Cleveland, while Amber is a Penninghame Major daughter and sold to Steve Langdon for 1000gns. Troloss Farms was also in the money for two unled heifers, Troloss Joker and Julie, again Blackcraig Rasputin daughters they made 1700gns to part time fireman Richard Maxwell, Howside, Ennerdale, Cleator, Cumbria. 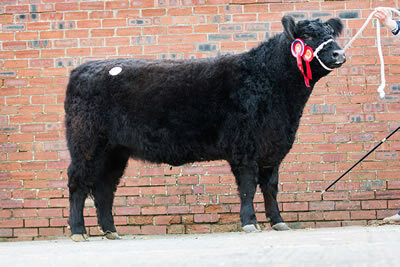 The only steer forward, an April born , Coldplay of Fingland son from Kilnstown Farms Ltd, Bewcastle, Carlisle sold to Alistair Paterson, Low Threemark, Stoneykirk for 1050gns and is for the 2016 winter show circuit.